The game's latest update also lets players send in-game gifts to friends. Fortnite: Battle Royale has a new limited time mode that encourages players to work together to achieve a common goal. The Team Rumble mode pits two teams of 20 players against each other, with the goal of being the first team to eliminate 100 opponents. During each Team Rumble match, players will respawn after five seconds when they’re eliminated. Users will keep the items in their inventory when they’re taken out, which should keep the action going throughout each match. 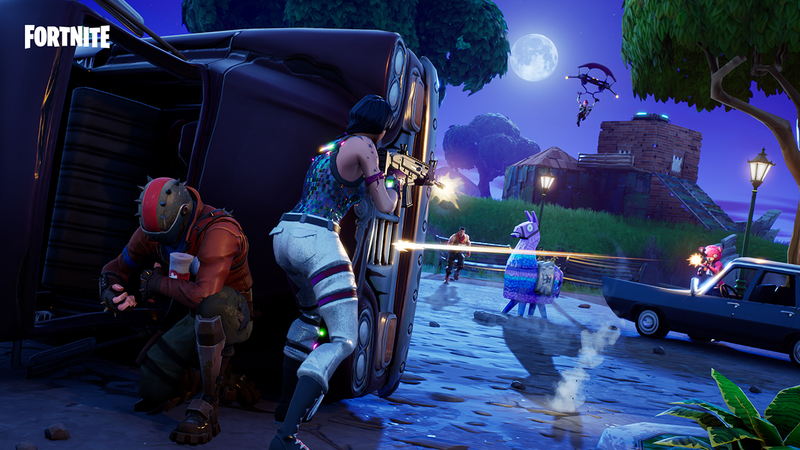 Fortnite’s latest update also adds new content to Save the World, Fortnite’s premium game mode. Specifically, Canny Valley Act 2 has been introduced, adding 21 new quests and a new landmark mission for players to complete. Fortnite: Save the World currently costs $39.99 on PC, and can be purchased as part of a Fortnite Founder’s Pack on PlayStation 4 and Xbox One, also priced at $39.99. Users will need to have been friends with someone for at least 48 hours before they can send them an in-game gift. Players can also only send gifts three times within a 24 hour period. Finally, users must have multi-factor authentication enabled on their account in order to send gifts. As one final note, gifting is not available for users on iOS devices. Check out our guide to learn how to turn on multi-factor authentication on your Fortnite account. If you’re looking for the perfect gift for the Fortnite superfan in your life, check out our Fortnite Holiday Gift Guide for some great ideas.